The man revolutionizing electric cars is now going after planes and trains, too. Elon Musk is developing the Hyperloop. It can carry passengers from San Francisco to Los Angeles in thirty minutes at speeds approaching Mach 1. He says it could be built for $6 billion dollars. Essentially, it’s a sealed, reduced-pressure tunnel carrying passenger cars riding on a cushion of air propelled by linear electric motors. Musk tackles two of the most essential problems to high-speed travel: air resistance and friction. The air pressure inside the tubes would be reduced to one millibar or 1/1000 the atmospheric pressure at sea level. Less air pressure equals less air resistance. Theoretical transportation systems have involved “evacuated" or “airless" tunnels. Maintaining a vacuum over large distances is quite difficult and exposes passengers to dangerous decompression. Friction is reduced by removing wheels and any contact with the tube. Maglev trains achieve this by using magnets to push the car away from the track. 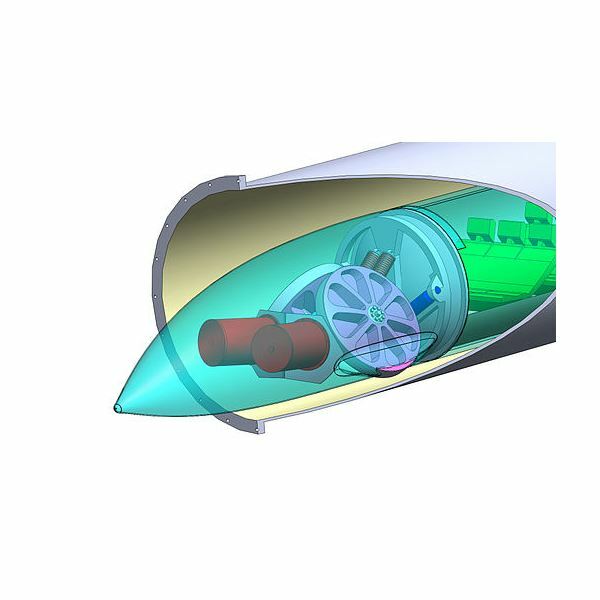 The Hyperloop cars would run on air-cushion skis. Air would be pumped through a myriad of small holes in the skis, lifting the car from the tube. Since the tube is at a near vacuum, not much air pressure would be required to lift the car from the tunnel. Another hurdle is choked flow. Even at low pressure, a car moving at high speed compresses air in front of it. Pressure builds and slows the car. To combat this, each Hyperloop car would have an air intake and compressor in its nose. The car would pull air in then propel in out the back. Some of this air would be diverted to the air skis underneath. This reduces pressure ahead of the car and produces thrust. The size of the tube in relation to the size of the car is also important. Air must have space to move around the car. To control cost and the size of the system, designers will want to keep the tubes small, so just the right ratio is essential. The idea of trains operating within tubes is not new. In 1812 British engineer George Medhurst published Calculations, in which he describes a method of moving people and cargo with air propulsion through sealed tunnels. This idea was used in 1864 for the Crystal Palace pneumatic railway in London. Trains were pulled or pushed along a railway by large, steam-powered fans. In 1869, the Beach Pneumatic Transit system operated in New York City. This one block underground prototype was the city’s first attempt at a subway system. The train was moved by pressurizing the rear of the tube and decreasing pressure at the front. Financial support of the project faded before a full-scale version was approved. Magnetic levitation trains currently operate in China, Japan and South Korea. Throughout the world, they are being studied and considered. The highest speed ever for a maglev train is 361 miles per hour, which was achieved in Japan at the Yamanashi test track. The work of Robert Goddard, who invented the liquid fuel rocket, seems to predict the Hyperloop. In the early 1900s, he wrote about nearly every aspect of Musk’s plan, including reduced air pressure, choked airflow and air bearings. He did not imagine linear electric motors, although scientists coming after him did. Continuing with Musk’s description of the project, the individual cars of the Hyperloop system will be similar to the Concorde Supersonic Transport. Each will be a sleek cylinder with exceptional aerodynamics. Behind the air intake and compressor will be a sound-deadening firewall and then the passenger cabin. The seats will be similar to those used on airplanes. They will be arranged in 14 rows of two. Unlike the Concorde, the Hyperloop cars will be much simpler, requiring no engines, wings or steering mechanisms. A rail gun is a futuristic weapon that uses a pair of electromagnetic rails to fire bullets at amazing velocities. The US Navy used an experimental rail gun to fire a seven-pound projectile at Mach 7. The technology can also be used to launch payload into space. The Hyperloop places the electromagnetic portion of the rail gun system in the floor of the tunnel, but only where necessary. Once at full speed of 760 miles per hour, the car can coast the main stretch for over 200 miles and still be moving at 730 miles per hour at the end. The car only needs to hold the considerably lighter rail portion, which is simply a hollow fin of aluminum. The electromagnetic system not only accelerates but also decelerates each car. In a method similar to the regenerative brakes on a Tesla automobile, kinetic energy is recaptured and stored during deceleration. A large portion of the necessary power to move the next car is created in this way. The remainder of the needed electricity will be generated by solar panels on the roof of every tunnel. Surplus power will be stored in battery cells. The system is estimated to produce 57 megawatts and only use 21 megawatts. The remainder will be sold back to the grid. The air hockey portion of the system involves the air-cushion skis creating a low-friction environment where the car glides as easily as a puck on an air hockey table. Specific ticket prices are far away. Be assured that the Hyperloop is intended to be not only faster than air travel, but also cheaper. Musk estimates that with an annual ridership of 7.4 million, $20 of each one-way ticket would be sufficient to pay off the project in twenty years. Surplus electricity from the solar cells will offset a great deal of daily operating costs. Numerous civic and business leaders doubt Musk’s $6 billion price tag. Some estimate closer to $100 billion. California may be a difficult place to build it. Already $9.95 billion in bonds have been secured for the California High-Speed Rail project, which aims to connect San Francisco and Los Angeles by 2029 with a 200 mile per hour train. Once developed, the technology could be used nearly anywhere. Musk assures that the system could be used above or below ground. Operating underwater would certainly have its own slew of problems. Tunneling through or building around mountains would add expense. The acceleration force would be no greater than the take-off of an airplane, but designers are careful to limit lateral g-forces. The Hyperloop cannot do sharp corners. At top speed, turn radius could be no less than 16 miles. In places where more turns are required, the cars could travel no faster than 300 miles per hour. Anywhere relatively flat and open would be a great place for a Hyperloop. Perhaps a coast-to-coast line across the Great Plains or curving north from Seattle across Canada to New York. Many aspects of the technology still need to be developed, but R&D is happening right now. Musk hopes to have a feasibility study completed in 2015. We may only be a decade or so away from completion in California or elsewhere. One day we may think it silly that we travelled across land in a slow, dangerous, complicated airplane. The Atlantic: The Real iPod: Elon Musk’s Wild Idea for a ‘Jetson Tunnel’ from S.F. to L.A.